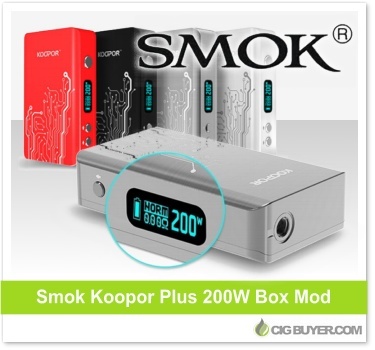 Answering the call of power hungry cloud chasers everywhere, Smoktech is now offering a larger, more powerful version of the Smok Koopor Mini – the Smok Koopor Plus 200W Box Mod. It offers up to 200W of power and uses High Frequency Dynamic Resistance Monitoring (HFDMR) to provide the extremely accurate temperature control. Powered by dual 18650 batteries, the Koopor Plus is compatible with nickel (Ni) or titanium (Ti) coils and includes a long list of advanced features – all in a sleek and unique looking package.